Magdala, the birthplace of Mary Magdalene, was a prosperous fishing village at the time Jesus was active in this region. 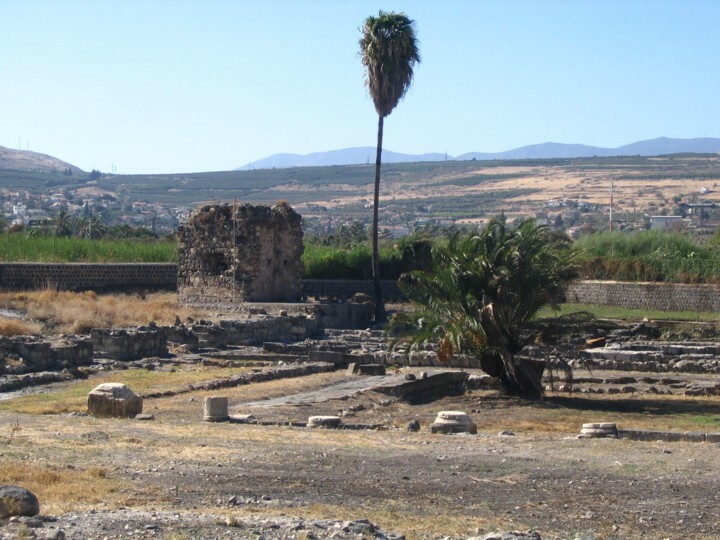 The ruins of the city are located on the northwest side of the Sea of Galilee, near the nearby modern town of Migdal. Magadala, or its Greek name Taricheae, became an important city in the Hellenistic period. Its location on the ancient road made it strategically important (the road from Netufa valley, via the Arbel valley, through Gennesareth valley on the shores of the Sea of Galilee, towards north and east). The water springs nearby, fertile land and fishing industry - all these made it the center city of one of the three Galilee regions in the Jewish Kingdom prior to the Romans. The ruins of this Roman village, seen in the photo above, are now enclosed within a wall. The archaeologists uncovered the remains of the village dating from the time of Jesus, and a later Byzantine monastery. A mosaic floor featuring a fisherman's boat was found at the place. Mk 8:10: "And straightway he entered into a ship with his disciples, and came into the parts of Dalmanutha". Mt 15:39: "And he sent away the multitude, and took ship, and came into the coasts of Magdala"